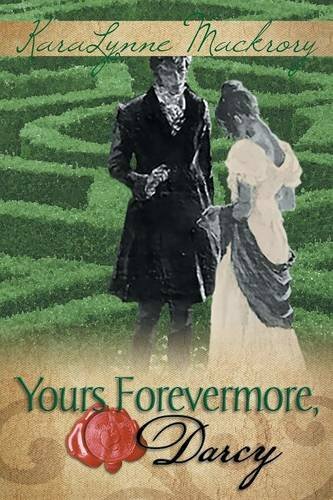 Can you imagine anything more romantic than Darcy writing letters to Elizabeth and signing them as “Yours Forevermore, Darcy”? This was the idea behind Karalynne Mackrory’s latest book. The intensity of Darcy’s feelings for Elizabeth led him to write her letters as a mean to cope with the feelings assaulting his heart and mind. But what if she were to receive them? Would she change her mind towards him? The plot starts after the Hunsford proposal, heartbroken Darcy leaves with Col. Fitzwilliam as it was planned, but unfortunate circumstances bring them back to Rosings almost immediately after they left. Mr. Darcy is then forced to be in Elizabeth’s present more often than he would wish at the time, but this will only allow her to see the man he truly is. The letters are not actually seen until the middle of the book and the story will continue at a slow pace in a very similar way to the original. I would have preferred to have more Darcy and Elizabeth scenes as we had in “Haunting Mr Darcy”. Karalynne Mackrory got us used to such wonderful scenes between them that I felt that in “Yours Forevermore, Darcy” there are too many scenes that are not between my tow favourite characters. But that also gives us the opportunity to read some interesting scenes of role reversal such as Jane telling Mr. Bingley that Lizzy has feelings for Mr. Darcy. Another interesting aspect of the book was the way Elizabeth exposed Whickam: it was very interesting, witty and Lizzy like. The humorous parts of the book were also interesting to read, the Darcy/Richard carriage scene is hilarious and really made me laugh but what I really enjoyed in this book was the fact that Darcy is not the only one writing letters. I don’t want to spoil anything for those who have not read the book, but Elizabeth also writes letters, and the connection and intimacy that is established through these letters is just delicious.